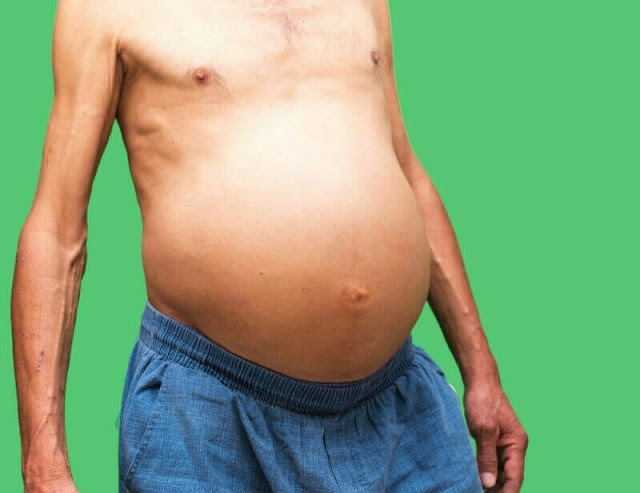 Home » Health » What Is Ascites? Ascites are conditions in which there is fluid in the abdominal cavity, exactly between the inner abdominal wall and the internal organs in the abdomen. This condition is generally caused by several diseases, such as liver disease, cancer, kidney failure, and heart failure. In general, ascitic fluid formed consists of 2 types, namely transudative fluid and exudative fluid. The difference between the two types of liquids lies in the levels of proteins contained in the liquid. Transudative has a protein content below 2.5 g / mL, whereas the exudative has a protein content equal to or greater than 2.5 g / mL. Currently there is a more useful division to determine the cause of ascites, which is the division according to serum-ascites albumin gradient (SAAG). This condition divides the cause of ascites as a result of portal hypertension or not. Portal hypertension is an increase in blood pressure in the blood vessels leading to the liver, or so-called portal vein system. Liver disease, such as cirrhosis , liver failure, and liver cancer. Spread of cancer to the liver. Heart valve disease, especially the valve that separates the right ventricle of the heart with the right portico (tricuspid valve). Portal vein thrombosis or blood clotting within the portal vein system. Low albumin protein, due to nephrotic syndrome or malnutrition. Diseases of the peritoneum, such as peritonitis , peritoneal cancer, and vasculitis. Disorders of pancreatic organs, bile, kidney, and ovary cells (ovaries). Miksedema , due to low thyroid hormones in the blood. Difficulty breathing, especially when lying down. The stool is black or bleeding. Skin and eyes turn yellow. To check the amount of fluid in the stomach. CT scan and MRI. To examine the condition of the abdomen and surrounding organs in depth. Blood test. This test includes a complete blood cell count, liver and kidney function tests, and measurement of electrolyte and protein levels. Angiography.Â Imaging is done by injecting a special dye to check blood flow, especially portal vein system. Laparoscopy.Â Operative action by making an incision equal to a keyhole to check the condition of the organs in the stomach. Analysis of ascitic fluid . This test is done by taking samples of ascitic fluid from the abdominal wall by using a needle. This action is called parasentesis or punksi ascites. After the fluid sample is taken, it is followed by a laboratory examination to determine the amount of blood cells, albumin levels, amylase enzymes, proteins, and glucose. The liquid analysis is to determine the fluid characteristics and determine serum-ascites albumin gradient (SAAG), to determine the possible causes of ascites. Ascitic fluid samples can also be examined to determine if there is a cancer cell (cytology) or a specific bacterial growth (culture). The main treatment of ascites is the treatment of the diseases that cause these ascites. To reduce the amount of ascitic fluid, doctors may prescribe diuretics . The recommended medication is a combination of furosemide and spironolactone . The drug will increase the discharge of body fluids through the kidneys. Treatment is accompanied by reduction of salt and fluid intake, to obtain optimal results. The addition of protein consumption or giving albumin supplements can be recommended for patients with low albumin blood levels. If there is infection, your doctor will prescribe antibiotics to treat the infection. If drugs do not help, especially for ascites with large stomach and large amounts of fluid, parasentesis or punksi ascites can be done to remove fluids, in addition to taking ascitic fluid samples. No different from the liquid sampling process for laboratory examination, the doctor will insert the needle through the outside abdominal wall to remove ascitic fluid. In patients with portal hypertension, trans-intrahepatic portosystemic shunts (TIPS) can be performed. This surgery is done by making a new vein ( shunt ) that connects the portal vein with hepatica vein, the blood vessels that come out of the liver, without passing through the liver cells first. This action can make the pressure on the portal vein system is reduced and can reduce ascitic fluid. However, keep in mind that the only way to reduce the pressure in the portal vein, rather than treating the cause of portal hypertension. If ascites are caused by cirrhosis, it may be advisable for liver organ transplantation. Spontaneous Bacterial Peritonitis (SBP). Infection that occurs in the abdominal cavity spontaneously due to fluid in the abdominal cavity. Heppenenal syndrome. Complications commonly occur in patients with cirrhosis resulting in renal failure. Difficulty breathing. Due to the fluid that suppresses the diaphragm muscles that play a role in breathing. Decreased awareness or hepatic encephalopathy. This condition is due to decreased liver function in detoxifying toxins, so toxins accumulate in the brain. Ascites can be prevented by avoiding risk factors for diseases that cause ascites. 0 Response to "What Is Ascites?"